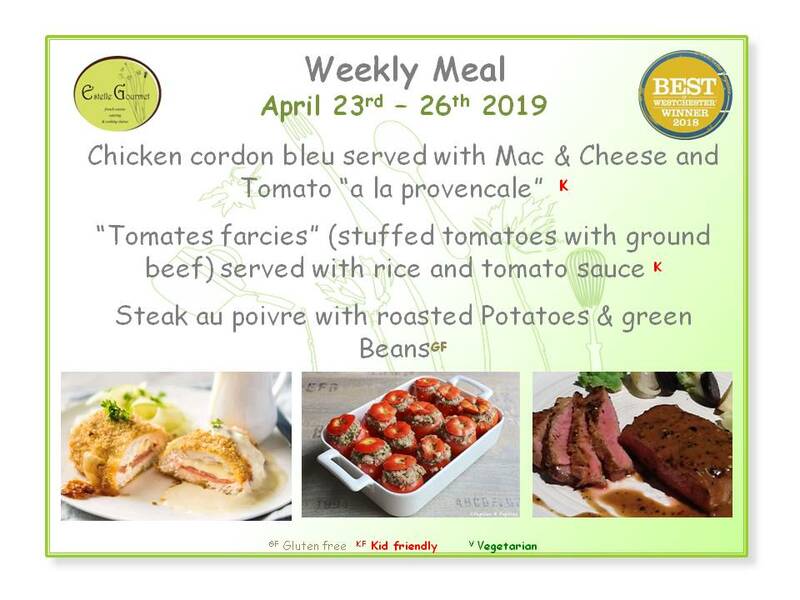 If you are interested to order your meals, please send us an email at estellegourmetllc@gmail.com, before Sunday, specifying the selected dish, the number of portions (adults and kids) and the pick-up day. Prices : $15 for an adult portion and $10 for kids portions (up to 12 years old). ​﻿Each week, Tuesday to Friday, enjoy your dinner of choice. Fresh seasonal products provided to suit your tastes and food restrictions, if any (diet, allergies…). The meals are well balanced and include a protein (meat, fish, soy beans, seeds, grains), vegetables and a starch. Dishes are wrapped, stored and come with reheating instructions. Just enjoy your meal without leaving your home!